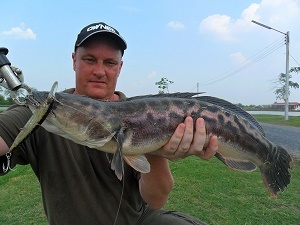 Lure Fishing , Fly Fishing and Snakehead fishing in Bangkok at Pilot 111 fishing ponds in Thailand allows anglers visiting Bangkok to experience thrilling lure angling action within a short distance of the city. The Giant Snakehead is one of Thailand’s most fearsome freshwater predatory species which has achieved a cult status amongst the many lure anglers of Thailand and South East Asia for many years. The Giant Snakehead and various other Snakehead species is a freshwater predatory monster fish which has recently sparked a wave of fear and hysteria which has spread across the world. Horrifying reports of mass invasions of the highly aggressive and invasive Giant Snakehead have shocked and astonished the world with some rivers in the United States reportedly being overrun by this most menacing of freshwater predators. Unsubstantiated and sometimes far fetched reports of Giant Snakehead being caught from as far a field as Europe and the United Kingdom have been well publicised in the international media prompting anglers in various countries from across the world to view the menacing Giant Snakehead as a potential threat to river systems throughout Asia and the western world. Recent high profile television documentaries featuring Giant Snakehead most notably by Dr.Zeb Hogan from National Geographic and other shows on Animal Planet have highlighted these most efficient and voracious of River Monsters on a global and international stage. The Giant Snakehead is an extremely ferocious and highly advanced predatory fish which is indigenous to Thailand and is widely distributed throughout the South Asian sub continent. The Giant Snakehead is an extremely accomplished and stealthy hunter that aggressively hunts prey fish in the rivers and lakes of Thailand and throughout Asia attaining weights to an impressive 10 kg’s. It inhabits various rivers, reservoirs, lakes and ponds throughout Thailand and is capable of surviving in oxygen depleted swamps and pools due to an amazing evolutionary development which allows the Giant Snakehead and other Channidae (snakehead family) species to naturally breathe oxygen. Lure fishing for Snakehead at Pilot 111 ponds in Bangkok, Thailand allows the angler visiting Bangkok the chance to fish for the awesome Giant Snakehead and several other species of freshwater predatory monster fish. 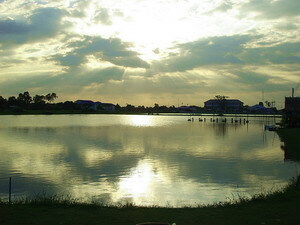 After a short fifty minute journey from Bangkok to Ban Pakong and the ponds, anglers will be greeted by a large well managed complex consisting of ten individual ponds of varying sizes covering a large area of several acres. Pilot 111 fishing ponds offers angling for various freshwater predatory species and has two ponds which are entirely devoted to Snakehead angling which have been heavily stocked with Giant Snakehead and Striped Snakehead. Lure fishing fans wishing to fish for other freshwater predators in Thailand can target a wide variety of other monster fish which include the highly acrobatic Barramundi, the hard fighting Asian Redtail Catfish, Pacu and several species of Featherback or Knifefish. 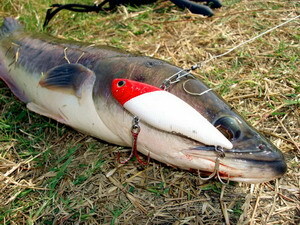 Whilst fishing for Snakeheads and the various other freshwater predators in the ponds, lure anglers will be guided by their own personal guide who will instruct them on the most effective lures and lure angling techniques withGiant Snakehead Fishing Pilot Ponds which to catch the hordes of hungry predators. On arrival at Pilot ponds anglers are equipped with light weight spinning outfits consisting of a 6ft spinning rod coupled with fixed spool spinning reel loaded with power pro braided mainline. Anglers lure fishing in Thailand at Pilot 111 fishing ponds for the Giant Snakeheads and other predatory monster fish will be supplied with a wide selection of artificial lures according to their chosen target species. Various patterns of artificial lure are effective at Pilot 111 fishing ponds with Cultiva lures and Rapalas in addition to various other patterns such as poppers, rubbers and propellers. The numerous predator lakes and ponds at Pilot 111 are ideally suited to fly fishing and lure angling with flat unrestricted banks allowing anglers plenty of space to cast. When lure angling for Snakeheads and the various other predators contained in the Pilot ponds visiting anglers will experience the exhilarating thrill of large predators savagely striking at artificial lures cast into the various ponds. Lure Anglers fishing for Snakehead and Barramundi at the Pilot ponds will enjoy explosive predator angling action as the Snakehead and Barramundi aggressively slam into various patterns of lures fished amongst the hordes of hungry predators. Angling at Pilot 111 fishing ponds in Thailand near Bangkok offers visiting anglers the opportunity to fish for Giant Snakehead and Striped Snakeheads on a short daily trip from Bangkok. Pilot ponds is ideally suited to anglers of all skill levels wishing to fish for Giant Snakehead, Barramundi and other freshwater predators with lures or the fly and is the closest and most convenient location to Bangkok where Giant Snakehead can be caught with regularity. Fly fishing trips to Pilot 111 can easily be arranged but fly fishing equipment is not supplied. Fly fishing at Pilot 111 ponds in Bangkok can be extremely productive when using medium weight outfits. We suggest that anglers wishing to indulge in fly fishing at this venue contact us for advice on the going flies and methods at the time of their planned fishing trip.